Sarah Kersey at a recent NASCAR race, where the four award finalists were treated to pit access. Longtime Flying Horse Farms volunteer and camp champion Sarah Kersey is one of four finalists for The NASCAR Foundation’s annual Betty Jane France Humanitarian Award. If she wins, camp will receive $100,000. Kersey is a cancer survivor who has a unique understanding of what seriously ill children and their family members face. She is a third-grade teacher in Dublin City Schools and has volunteered with Flying Horse Farms since camp opened its gates in 2010. Flying Horse Farms is the camp for seriously ill children that is just east of Mount Gilead on State Route 95. She is also a lifelong NASCAR fan. At camp, Kersey does everything from bunking in cabins with kids for a week at a time in the summer to spending fall weekends at camp singing songs, making crafts and shooting arrows with campers and their families. “I am truly changed for the better because of camp. There aren’t enough words to describe the transformational moments that I have experienced,” Kersey said. Because Kersey is a finalist, Flying Horse Farms is guaranteed to receive a minimum $25,000 donation from The NASCAR Foundation. If she wins, camp will receive a $100,000 gift. The winner is determined by public vote online. You can vote for Sarah every day through Nov. 19 at www.NASCARfoundation.org/award. 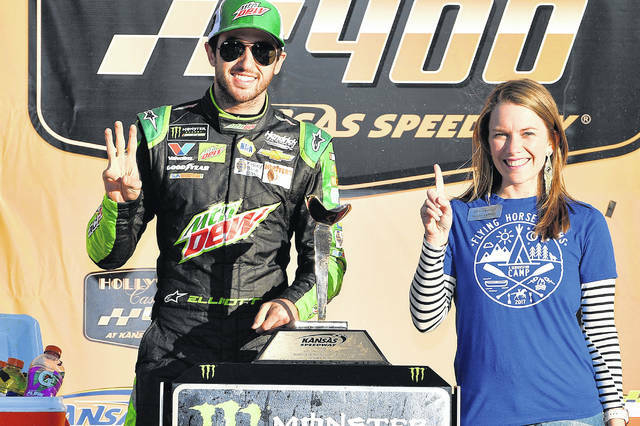 https://www.morrowcountysentinel.com/wp-content/uploads/sites/29/2018/11/web1_FHF-NASCAR2.jpgSarah Kersey at a recent NASCAR race, where the four award finalists were treated to pit access.